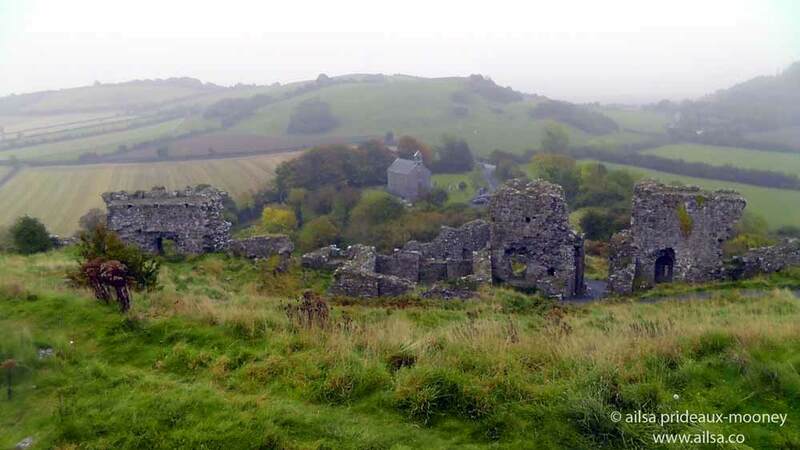 Rock of Dunamase | Where's my backpack? There are plenty of places in Ireland it is advisable to avoid when the weather turns to drizzle and fog, but the Rock of Dunamase is not one of those places. If anything, a good dusting of drizzle and a liberal swathe of fog adds a delicate ethereal touch to these captivating ruins. 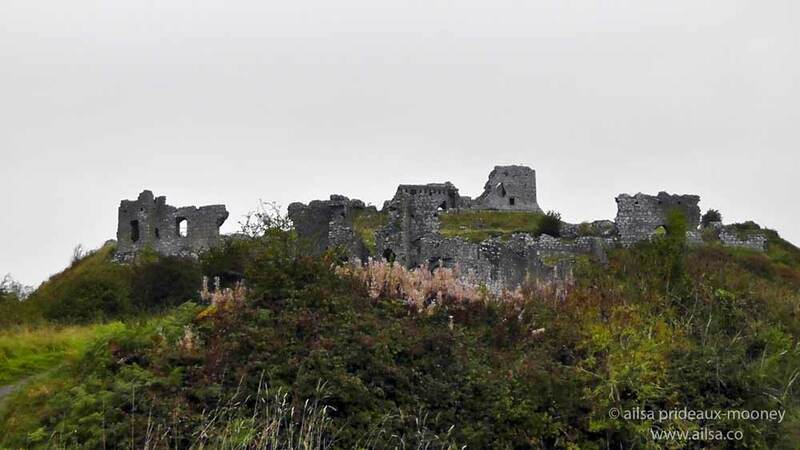 It’s not far off the main road from Carlow to Portlaoise, and the loop that takes you from the small roadside car park to the summit and back again is a short and easy climb that you could easily complete in just a handful of minutes, but something tells me the magic of this place will lead you astray and you’ll find yourself wandering through the ruins in an enchanted reverie. This site may have been a place of importance as far back as the 2nd century when Greek cartographer Ptolemy drew a map of Ireland and marked a site of note named Dunum in this area. In later years a Celtic castle that sat atop this rocky outcrop was invaded by the Vikings in 843AD. 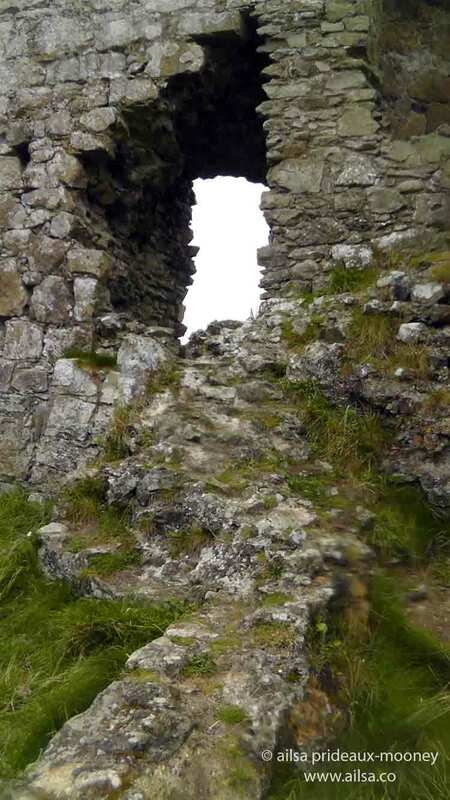 In 1250AD the King of Leinster, Dermott MacMurrough, built a great stone castle here which passed through marriage to the Norman invador Strongbow. 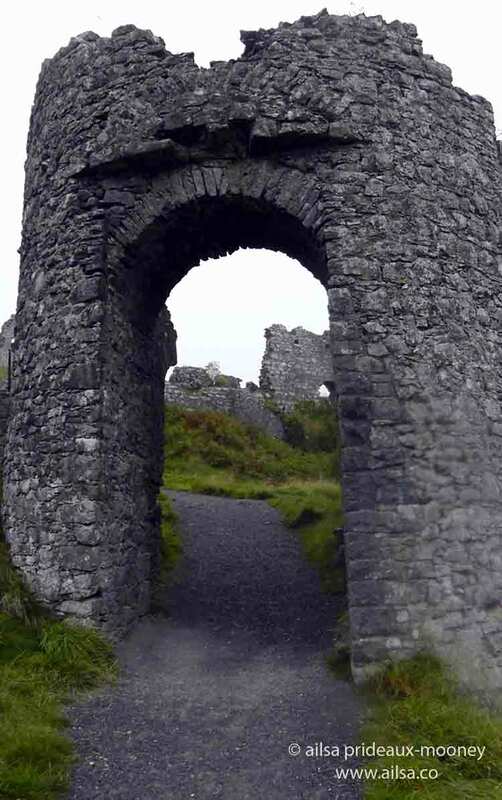 Strongbow developed the castle into an imposing fortification, the ruins of which are still standing today. It wasn’t until the Cromwellian invasion of 1650 that these great old structures were destroyed. 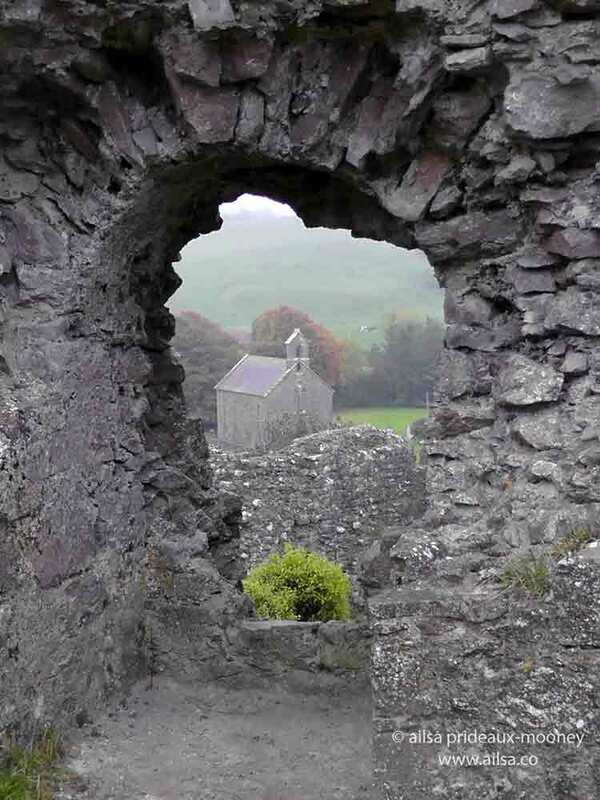 …past ivy-clad walls gently crumbling away, stopping every so often to peep through nooks and crannies and windows in the ruin walls that offered tantalizing glimpses of the foggy countryside below and the small granite church standing guard at the base of the hill. Rain streaked across my camera lens but did nothing to dull the vibrant greens of the soft blanket of moss and ferns that decked the rocks on either side of the trail, glowing almost neon bright in the foggy haze. 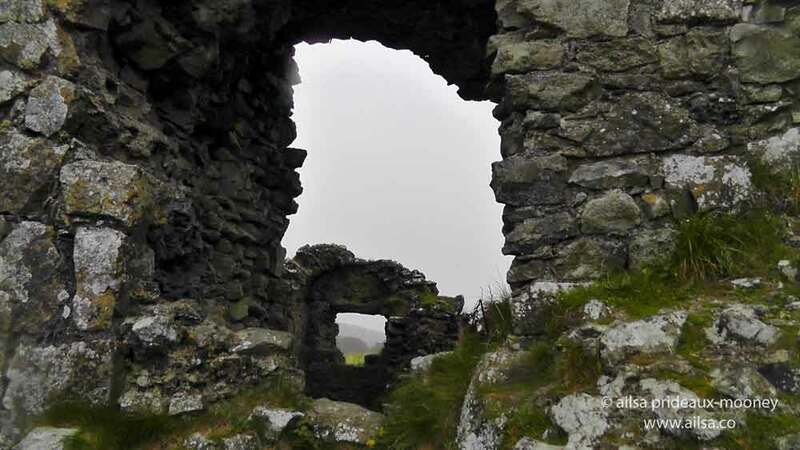 …and of course, I obliged, clambering through and over and up and under every square inch of the ruin, beads of rain glistening from every surface and the mist swirling in great eddies around the edges of the castle. The view from the summit was nothing short of breathtaking. Leaving filled me with a vague sense of wistfulness, as I suspect it has many others who have gone before me. It is somewhere I feel bound to return to, and it is somewhere I hope you get to visit for yourself someday soon. This entry was posted in Europe, Ireland, Photography, Travel and tagged history, inspiration, photography, photos, pictures, travel, writing. Bookmark the permalink. I would love to go back to Ireland. There’s so much to see, Francesca, come back for sure! Can you imagine the history of that place. I would love to get to Ireland some day. Very pretty photos! Lovely setting with the Irish fog. There’s something about fog that adds an element of intimacy to a place, I felt like I was the only person for miles around, even though there were other people visiting the rock that day too. Love the composition of the photo of the church through the arch, Ailsa. or search for “history” or “trencin” on my blog. I hope you can visit these places in the future. Have a blessed weekend! Another magical place, you’ve discovered for us. My absolute favorite pics is the 3rd one from top, with the ruins as a frame for the church below. Very sweet. It’s such a lovely spot, Annette, a place for dreamers. 🙂 Just saw your stunning autumn photos, those colours are so vibrant. Thanks for stopping by, Ailsa. Lovely piece. I was with you every step of the way. I was the one smelling like wet dog! Increԁible story there. What happened afteг? Thanks! 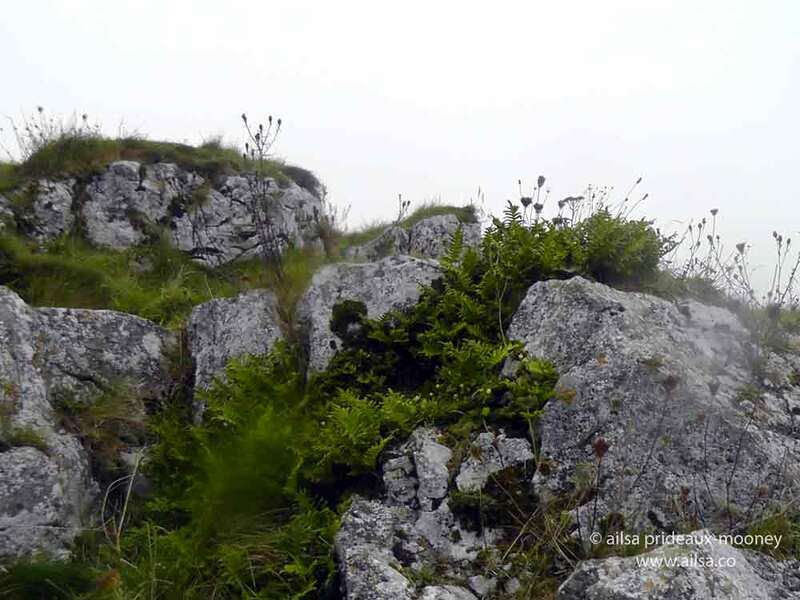 Love the way it’s not at all *manicured … tufty grass .. slabs of castle ruins and Irish soft mist … perfect . Your creative photos and description illustrate very well how this magical place can fire up the imagination!